I found something great for you, folks, as it is rare Disneyland Paris pictures shot 21 years ago, when the park opened in 1992, and some even before when the park was still in the works. And they're coming from good photographers as they were shot by Magnum photo agency team. Let's start by these pics probably shot in 1991 showing Frontierland and Adventureland still in construction. Next, is a fantastic opening day shot showing the awesome marching band in Main Street U.S.A! A picture of Frontierland which might have been shot shortly after opening day. Who remember the first - and great - Disneyland Paris parade with the dragon breathing fire? Ah, the good old days when you could sunbathe at Discoveryland! Another pic of Discoveryland, shot at sunset. Disneyland Paris hotels were also shot by Magnum photographers, like the New York hotel. Note in the foreground the Manhattan map in front of the hotel, where is now a ice-skating rink. A great view of the park at night in its early days. Note the airship in the sky with the Renault logo on it, which was there during opening days as Renault was the sponsor of the Discoveryland Visionarium attraction. A night picture of Discoveryland. The Renault airship is still in the sky! Some pictures of the now - very unfortunately - extinct Main Street Electrical Parade! You probably remember the good old days when the Disney Village still had its steel columns and "star sky" as envisioned by architect and Pritzker Prize winner Frank Gehry. A last great picture showing the Disneyland Hotel at opening days at night. 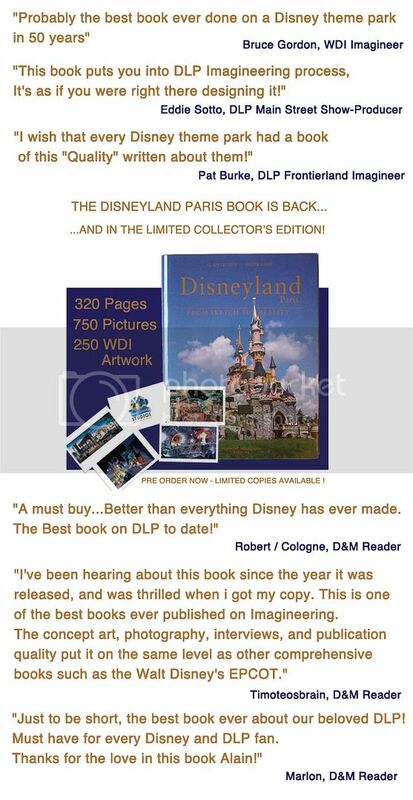 Talking about Disneyland Paris i remind you the promo on my Disneyland Paris book valid all during January and you still can order the book and enjoy a free shipping! The book price whether it's in its ENGLISH or FRENCH edition is 75 euros including free shipping worldwide which help to save $20, so order your own copy now at the best price on the market to don't miss the great Disneyland Paris "From Sketch to Reality" book which will tell you all about the creation of Disneyland Paris with 320 pages including 500 pictures of the park and 250 WDI renderings! Wasn't it a Renault Airship? It hurts to see them because I just came back from DLP and I´m still in the Disney Blues. The airship in the first picture looks like an UFO. Yes, you're right the airship had the logo Renault on it! I'm going to do an editing right now. It's a shame that the castle doesn't have its original and very realistic colour scheme anymore. Loved it back in those days. Great pictures of the most beautiful Magic Kingdom! It's a real pity that this resort is so badly managed and its financial situation also doesn't help. Lovely photos. The one of Frontierland hostesses, should be from the grand opening party itself....note the linen table clothes and food service out in walkways....and guests are wearing the opening event sweatshirts, which were distrbuted as a sort of ticket.